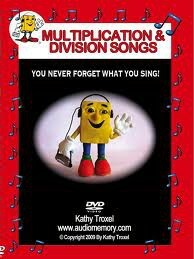 Multiplication and Division Songs DVD - all the tables through the 12 times tables in the form of echo style songs with lyrics in sync with the music. Includes Division Songs and Practice as Division and Practice as Fractions. From Audio Memory.